When buying a home there are multiple costs associated with closing the real estate transaction. One of the items that a buyer will see on their closing summary statement, and something their attorney should discuss with them before the closing, is the purchasing of title insurance. What is Title Insurance? What does it cover? Why do buyers need it? In short, title insurance is a policy that protects the purchase of real estate for owners and their mortgage companies. The Title is the sum of all the documents that create the legal history of the ownership of the underlying property. With any purchase, the attorney or a title searcher will perform a title search, to check for existing defects such as mortgages, liens, easements, servitudes, etc. The title search will tell you exactly how the property is currently owned, so that a buyer knows exactly what they are purchasing…or so it would seem. This is where title insurance comes in. What does Title insurance cover in New York? Attorneys fees and legal expenses for defense of covered claims. Title insurance not only covers you while you own the property, but even covers any liability you may have to future owners. Why do Buyers of New York real estate need Title Insurance? Title insurance is mandated by lenders (banks and mortgage companies) because they want to make sure the money they are lending is actually going to buy the property as described, since that property acts as collateral, and the title insurance makes sure that the lender is protected from any mistakes, errors, and omissions in the title search or land records for the amount of the loan. Shouldn’t home owners have the same type of guarantee that their newly purchased home is, and will be, theirs? Yes, and that is why there is an owners policy that covers the owner for the entire value of the property at a small additional cost. What is the cost for Title Insurance? Unlike most insurance policies which require a continual annual premium paid in monthly payments, title insurance is a one time premium that is paid at closing. The cost of title insurance (the “premiums”) are regulated by the statute. The prices between the multiple title insurance companies are similar if not identical, only varying by a few dollars. However, fees for title searches and other ancillary products or services can range greatly between title insurance companies. The bottom line is that Title Insurance can do a great deal to put a home owners mind at ease. Many times we hear horror stories of driveways built on a neighbors property or additions built without zoning permits. Title insurance can cover the unknown risks of home ownership, with a one time premium that can be added to the mortgage amount, that protects you even after you sell the property, and that covers all attorneys fees and legal costs also. Aboriginal title in New York refers to treaties, purchases, laws and litigation associated with land titles of aboriginal peoples of New York, in particular, to dispossession of those lands by actions of European Americans. The European purchase of lands from indigenous populations dates back to the legendary Dutch purchase of Manhattan in 1626, "the most famous land transaction of all." More than any other state, New York disregarded the Confederation Congress Proclamation of 1783 and the follow-on Nonintercourse Acts, purchasing the majority of the state directly from the Iroquois nations without federal involvement or ratification. New York is the source of several landmark decisions concerning aboriginal title including Oneida I (1974), "first of the modern-day [Native American land] claim cases to be filed in federal court," and Oneida II (1985), "the first Indian land claim case won on the basis of the Nonintercourse Act." New York was the site of nearly all remaining Native American possessory land claims when the United States Court of Appeals for the Second Circuit held in Cayuga Indian Nation of N.Y. v. Pataki (2005) that the equitable doctrine of laches (duty of "timeliness") bars all tribal land claims sounding in ejectment or trespass, for both tribal plaintiffs and the federal government as plaintiff-intervenor. Since the ruling, no tribal plaintiff has overcome the laches defense in a land claim in the Second Circuit. There are currently 10 Indian reservations in New York: Allegany Indian Reservation, Cattaraugus Reservation, Oil Springs Reservation, Oneida Reservation, Onondaga Reservation, Poospatuck Reservation, St. Regis Mohawk Reservation, Shinnecock Reservation, Tonawanda Reservation, and Tuscarora Reservation. The Charter of Freedoms and Exemptions (1629) contained the first codified prohibition on private purchases of land from Indians. The details of the early dealings with indigenous peoples by the Dutch New Netherland settlements are not known with certainty. The first recorded land transaction is reported by a letter from Peter Schagen, the deputy of the Dutch West India Company, on November 5, 1626, claiming: "They have purchased the Island Manhattes from the Indians for the value of 60 guilders; 'tis 11,000 morgens in size." Many secondary sources simply report this value as $24; of course: United States Dollars (and the United States) did not exist in 1626; 60 guilders likely represented the estimated value of trade goods; the historical exchange rate calculation used to reach this figure is not known (if in fact it is the source of any such calculation). By comparison, the value of the goods on the ship bearing the letter back to the Netherlands was 45,000 guilders. Sixty guilders in 1626, converted and adjusted for inflation, would be $888 in 2001 U.S. dollars. Prof. Banner, noting that the transaction was the first "purchase" of land from the indigenous population of the continent, and the fact that the natives remained in Manhattan and traded with the Dutch, argues that they would have been extremely unlikely to understand the transaction as a "sale." Other sources date the transaction to May 6, 1626. Dutch land patents traced their title to such a purchase. The colony's "New Project of Freedoms and Exemptions" (1629) prohibited private purchases of land from the indigenous population; a privilege reserved only for the Patroons of New Netherland. An amendment in 1640 gave preference "in the selections of land" to those who notified the Company. The Patroons' reports to the States General refer to other land purchases in June 1634, October 25, 1634, and 1651. The British concluded the Treaty of Fort Stanwix with the Iroquois in 1768, bringing the boundary line of the colony into conformity with the Royal Proclamation of 1763. The method of purchasing lands established in that treaty was codified in the 1777 Constitution of New York. During the Articles of Confederation-era, New York purchased a large amount of land from the Iroquois without complying with the requirements of the Confederation Congress Proclamation of 1783. Two-hundred years later, the Second Circuit held that the Confederation Congress had neither the intent nor the authority to restrict such purchased by states within their borders. New York and Massachusetts had long-disputed the property and sovereign rights to modern-day western New York. They resolved their differences in 1786 with the Treaty of Hartford, granting the property rights to Massachusetts and the sovereign rights to New York. In 1788, Oliver Phelps and Nathaniel Gorham acquired the pre-emptive rights to western New York from the state of Massachusetts in what became known as the Phelps and Gorham Purchase. I am not uninformed that the six Nations have been led into some difficulties with respect to the sale of their lands since the peace. But I must inform you that these evils arose before the present government of the United States was established, when the separate States and individuals under their authority, undertook to treat with the Indian tribes respecting the sale of their lands. But the case is now entirely altered. The general Government only has the power, to treat with the Indian Nations, and any treaty formed and held without its authority will not be binding. Here then is the security for the remainder of your lands. No State nor person can purchase your lands, unless at some public treaty held under the authority of the United States. The general government will never consent to your being defrauded. But it will protect you in all your just rights. Phelps and Gorham defaulted on their payments to Massachusetts in 1790 and the un-exercised western portion pre-emptive rights reverted to the state in 1791. 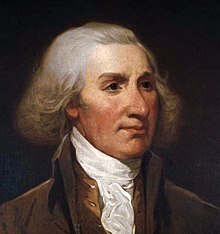 Massachusetts resold the rights to Robert Morris that year. Morris retained the Morris Reserve for himself and sold the western portion of his rights to the Holland Land Company in 1792 and 1793 (the Holland Purchase). The state of New York disregarded the requirements of the Nonintercourse Act (that a federal commissioner be present and that any sale of Indian lands be approved by Congress) and purchased lands directly from Indians within the state until 1846. According to Prof. Hauptman: "American Indians, the state's first residents, ended up in a quasicolonial status, dependent on the very people—Albany policymakers—who were responsible for dispossessing them. It is little wonder that the legacy of this colonial relationship in modern times has been the Iroquois land claims movement and that the lead community pushing these claims is the Oneidas . . . ."
July 28, 1795 Oneida According to Prof. Hauptman, the treaty was the "model for all Albany's efforts to dispossess the Oneidas for the next half-century." And whereas it is of great importance to the safety of this State that peace and amity with the Indians within the same be at all times supported and maintained; and whereas the frauds too often practiced towards the said Indians, in contracts made for their lands, have, in divers instances, been productive of dangerous discontents and animosities: Be it ordained, that no purchases or contracts for the sale of lands, made since the fourteenth day of October, in the year of our Lord one thousand seven hundred and seventy-five, or which may hereafter be made with or of the said Indians, within the limits of this State, shall be binding on the said Indians, or deemed valid, unless made under the authority and with the consent of the legislature of this State. [Indian lands. ]—No purchase or contract for the sale of lands in this state, made since the fourteenth day of October, one thousand seven hundred and seventy-five, or which may hereafter be made, of or with the Indians in this state, shall be valid, unless made under the authority, and with the consent, of the legislature. [Indian lands. ]—No purchase or contract for the sale of lands in this state, made since the fourteenth day of October, one thousand seven hundred and seventy-five, or which may hereafter be made, of or with the Indians, shall be valid unless made under the authority and with the consent of the legislature. [Purchase of lands of Indians. ]—No purchase or contract for the sale of lands in this State, made since the fourteenth day of October, one thousand seven hundred and seventy-five; or which may hereafter be made, of, or with the indians, shall be valid, unless made under the authority, and with the consent of the Legislature. § 13 was repealed on November 6, 1962, by popular vote. The New York legislature passed two laws in 1784 and 1785 for the "settlement of the waste and unappropriated lands"; the laws created methods to advertise and distribute Indian lands to private citizens, even before the aboriginal title was extinguished. Legislation enforcing the constitutional prohibition with sanctions was not passed until 1788. In Feb. 1798, the legislature passed an act "Authorizing the Governor to Appoint Commissioners to treat with the Oneida Indians for the purchase of part of their lands." [I]t shall be unlawful for any person or persons, other than Indians, to settle or reside upon any lands belonging to or occupied by any nation or tribe of Indians within this state; and that all leases, contracts and agreements made by any Indians, whereby any person or persons, other than Indians, shall be permitted to reside upon such lands, shall be absolutely void; and if any person or persons shall settle or reside on any such lands, contrary to this act, it shall be the duty of any judge of any court of Common Pleas of the county within which such lands shall be situated, on complaint made to him, and on due proof of the fact of such settlement or residence, to issue his warrant, under his hand and seal, directed to the sheriff of such county, commanding him, within ten days after the receipt thereof, to remove such person or persons so settling or residing, with his, her or their families, from such lands. ^ a b c Banner, 2005, at 75. ^ Gunther, 1958, at 3--7. ^ Vecsey & Starna, 1988, at 144. ^ Vecsey & Starna, 1988, at 145. ^ Kathryn E. Fort, The New Laches: Creating Title where None Existed, 16 Geo. Mason L. Rev. 357 (2009); Patrick W. Wandres, Indian Land Claims, Sherrill and the Impending Legacy of the Doctrine of Laches, 31 Am. Indian L. Rev. 131 (2006). ^ Oneida Indian Nation of N.Y. v. County of Oneida, 617 F.3d 114 (2d Cir. 2010); Onondaga Nation v. New York, 2010 WL 3806492 (N.D.N.Y. 2010); Shinnecock Indian Nation v. New York, 2006 WL 3501099 (E.D.N.Y. 2006). ^ Royce, 1971, at 575. ^ 1 N.Y. Colonial Doc. 37. ^ a b Banner, 2005, at 76. ^ Felix S. Cohen, Original Indian Title, 32 Minn. L. Rev. 28, 38--39 (1947). ^ Martha J. Lamb, History of the City of New York 53. ^ See, e.g. 1 N.Y. Colonial Doc. 44 (patent issued to Kiliaen Van Rensselaer). ^ 2 N.Y. Colonial Doc. 96--100. ^ 2 N.Y. Colonial Doc. 119. ^ Royce, 1971, at 577--78. ^ a b N.Y. Const. of 1777 art. XXXVII. ^ Oneida Indian Nation of New York v. New York, 649 F. Supp. 420 (N.D.N.Y. 1986), aff'd 860 F.2d 1145 (2d Cir. 1988), cert. denied, 493 U.S. 871 (1989). ^ a b c d e Hauptman, 2001, at 88. ^ Hauptman, 2001, at 69--74. ^ Hauptman, 2001, at 7, 47. ^ Hauptman, 2001, at 220. ^ 7 Stat. 15; see Royce, 1971, at 648--49. ^ 7 Stat. 16; see Royce, 1971, at 648--49. ^ 7 Stat. 33; see Royce, 1971 at 650--53. ^ 7 Stat. 44; see Royce, 1971, at 652--55. ^ 7 Stat. 55; see Royce, 1971, at 656--57. ^ 7 Stat. 61; see Royce, 1971, at 658--59. ^ 7 Stat. 601; see Royce, 1971, at 658--61. ^ 7 Stat. 70; see Royce, 1971, at 662--63. ^ 7 Stat. 72; see Royce, 1971, at 662--63. ^ 7 Stat. 550; see Royce, 1971, at 768--773. ^ 7 Stat. 586; see Royce, 1971, at 776--77. ^ 11 Stat. 735; see Royce, 1971, at 818--19. ^ a b Hauptman, 2001, at 66. ^ Hauptman, 2001, at 70. ^ Hauptman, 2001, at 77-78. ^ Hauptman, 2001, at 77. ^ Hauptman, 2001, at 67, 76--77. ^ Hauptman, 2001, at 78. ^ Hauptman, 2001, at 80. ^ Hauptman, 2001, at 86. ^ N.Y. Const. of 1821 art. VII, § 12. ^ N.Y. Const. of 1846 art. I, § 16. ^ N.Y. Const. of 1938 art I. § 13; N.Y. Const. of 1894 art. 1, § 15. ^ Hauptman, 2001, at 63. ^ Laws of Colonial and State Governments in Regard to Indian Affairs 63--65. ^ Laws of New York, chap. 23 (Feb. 26, 1798); see Hauptman, 2001, at 95--96. ^ Laws of 1821, 183, §§ 1, 5 (current version at McKinney's Indian Law § 8 (2000)). ^ See Hauptman, 2001, at 200--01, 204. Kristina Ackley, Renewing Haudenosaunee Ties: Laura Cornelius Kellogg and the Idea of Unity in the Oneida Land Claim, 32 Am. Indian Culture & Res. J. 57 (2008). Stuart Banner, How the Indians Lost Their Land: Law and Power on the Frontier (2005). Jack Campisi, The New York-Oneida Treaty of 1795: A Finding of Fact, 4 Am. Indian L. Rev. 71 (1976). Kathryn E. Fort, Disruption and Impossibility: The Unfortunate Resolution of the Modern Iroquois Land Claims, 11 Wyo. L. Rev. 375 (2011). Barbara Graymont, New York State Indian Policy after the Revolution, 57 New York Hist. 438 (1976). Gerald Gunther, Government Power and New York Indian Lands—A Reassessment of the Persistent Problem of Federal State Relations, 8 Buff. L. Rev. 1 (1958). Laurence M. Hauptman, Conspiracy of Interests: Iroquois Dispossession and the Rise of New York State (2001). Laurence M. Hauptman, Formulating American Indian policy in New York State, 1970-1986 (1988). Laurence M. Hauptman, Seneca Nation of Indians v. Christy: A Background Story, 46 Buffalo L. Rev. 947 (1998). James Kent, Commentaries on American Law (1st ed. 1826) (rev. ed. 1889). J. David Lehman, The End of the Iroquois Mystique: The Oneida Land Cession Treaties of the 1780s, 47 Wm. & Mary L. Rev. 523 (1990). Robert B. Porter, Legalizing, Decolonizing, and Modernizing New York State's Indian Law, 63 Alb. L. Rev. 125 (1999). Cuthbert W. Pound, Nationals Without a Nation: The New York State Tribal Indians, 22 Colum. L. Rev. 97 (1922). Charles C. Royce, Indian Land Cessions in the United States (1971). George C. Shattuck, The Oneida Land Claims: A Legal History (1991). H. Upton, The Everett Report In Historical Perspective: The Indians of New York (1980). Allen Van Gestel, The New York Indian Land Claims: An Overview and a Warning, 53 N.Y. St. Bar J. 182 (1981). Christopher Vecsey & William A. Starna (eds. ), Iroquois Land Claims (1988). Howard A. Vernon, The Cayuga Claims: A Background Study, 4 Am. Indian Culture & Res. J. 21 (1980).